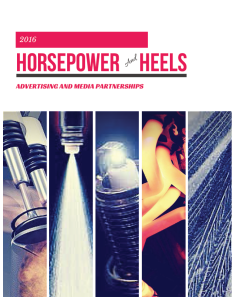 For over 10 years, Horsepower & Heels has worked hard to evolve and grow in our mission to celebrate, promote and support women in motorsports and automotive. We are steadily growing, and have big plans for the future! A long-standing labor of love, HorsepowerandHeels.com is home to a talented team of hard-working volunteers that dedicate hours of their time to helping to advocate and promote women in racing and automotive. From regular news coverage celebrating their on-track successes, to helpful How-to articles, Reviews, and open dialog about the challenges that women in the sport face, Horsepower & Heels is not only a helpful and inspiring tool for females in the motorsport community, but is also a popular online publication for fans of both genders. The Horsepower & Heels team is ready to take the next step in offering specialized resources for women in racing – things like a webinar series dedicated to racing career essentials, women in motorsports workshops and networking mixers, discount program for racers, and sponsorship support. To reach these goals, we are branching out to help accelerate our growth. As part of our expansion, we are excited to announce our 2016 Advertising Opportunities! With over 16 years combined marketing and automotive experience, our team can help you drive your message and reach your marketing goals! Get exposure through online display ads, newsletter advertising, social media engagement, editorial support and more! Plus, you can also be a part of a leading organization dedicated to celebrating, promoting and supporting women in motorsports and automotive. Interested advertisers can choose from our 4 levels of display ad packages, or contact us for a customized approach!